Posted on March 16, 2010	by Lou Murray, Ph.D.
Beware the Ides of March! But maybe that only applies to Julius Ceasar. Seems like yet another beautiful day here in sunny southern California. Forecast for LA for this week is temps in the 80s. Wow. That’s unseasonably warm. Here on the coast in Orange County, we don’t expect to get quite that warm, but the warming days should make my tomato and eggplant seedlings grow better. Right now, they’re only showing cotyledon leaves. 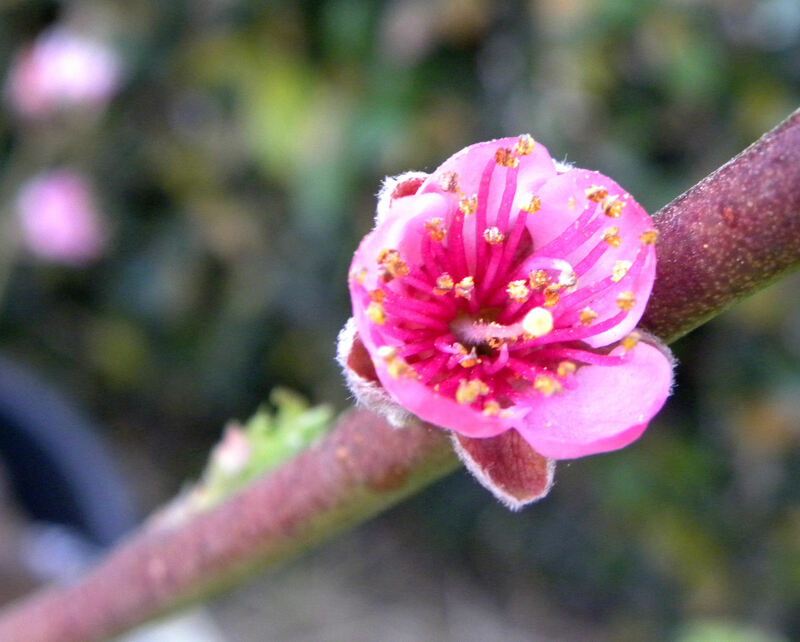 The first blossom on the Katy apricot opened today. 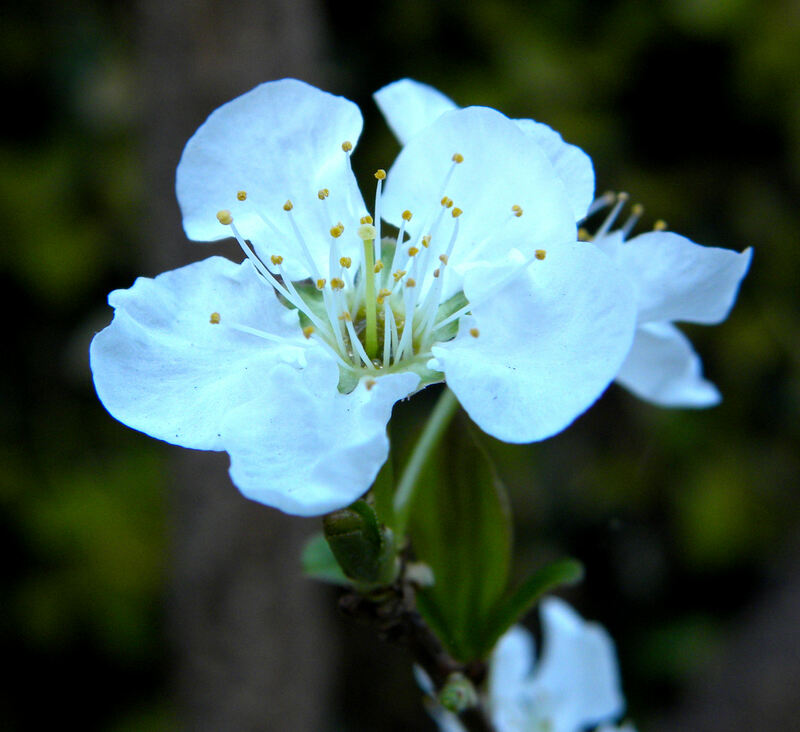 The first blossoms opened on the Santa Rosa plum as well. 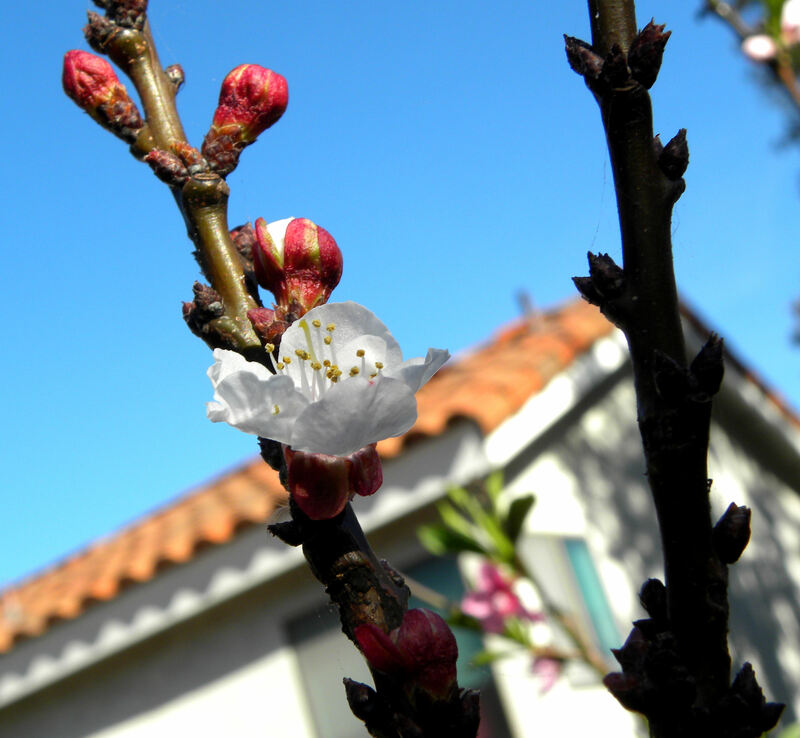 The first blossoms on my Katy apricot and Santa Rose plum opened today. I’m hoping for a good fruit harvest this summer, but it’s likely to be mostly peaches and nectarines. The blossoms on the apricot and plum are pretty sparse. We had the plum pruned this spring, so it has a good excuse for low production. I’ve heard that apricots produce heavily only every other year, and this doesn’t seem to be its year. The first blossoms opened on the Improved Babcock peach a days ago. They're not very decorative. Maybe the petals will get bigger later. But my greens are growing and the three hens are laying. The hens eat a LOT of greens, probably several pounds a week. I don’t count that in my produce harvest. It goes into the egg harvest. The three hens love their greens. 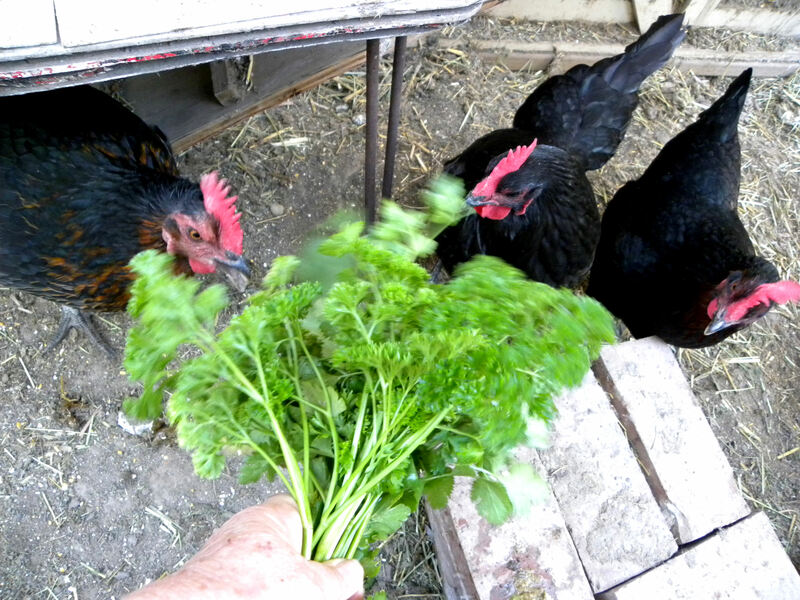 Here they're eating a mixed bouquet of parsley, sorrel, and cilantro. No wonder their eggs taste so good. Here’s my harvest for this week. 18 eggs! This is the most so far in one week. This entry was posted in Uncategorized and tagged backyard chickens, Harvest Monday, urban chickens, vegetable garden. Bookmark the permalink. Congrats on the large egg harvest. Peach trees :> I can’t wait to move so I can start planting trees. I want a peach, a nectarine, and some apples. I haven’t looked up the peach pollination, but I guess I’ll figure out before I plant how many I really need. I just hope we end up with a place with lots of space for edibles. Hi Daphne, thanks. If anyone deserves a place with a lot of space for edibles, it’s you. You’re such a good gardener. I wish I could send the ladies some of our parsley – we have more than we can eat at the moment. I’ll bet those eggs are flavorful! Nothing like having the fruit trees start blooming. That’s always a promising sight. Hi Villager, I’m amazed that you have parsley already. It must have overwintered. Very nice egg harvest amoung other things. Yeah, greens are really getting going around here too. We’ve been having exceptional weather so I feel a few weeks ahead of schedule. Hi Ottawa Gardener, I’m amazed that your greens are growing already. Congrats. Hope your weather holds for you. Beautiful flowers, wonder our apricot and plum trees are budding, I haven’t got time to check out the plants at the old house. Your girls are doing a good job of supplying you with tasty eggs. Hi Mac, I hope your garden is doing well. Your girls are so pretty! I love the fruit tree blossoms too. We’re getting a dose of that lovely weather as well, it’s supposed to get into the 70’s this week. Yippee! Hi Michelle, isn’t this warm weather nice?